I love subway art and typography. Lately I’ve become a regular Art Institute of Five Minute Projects and our scrap woodpile has become my supply source. I had been wanting to make some nativity themed artwork and put some focus on the real reason we celebrate Christmas. 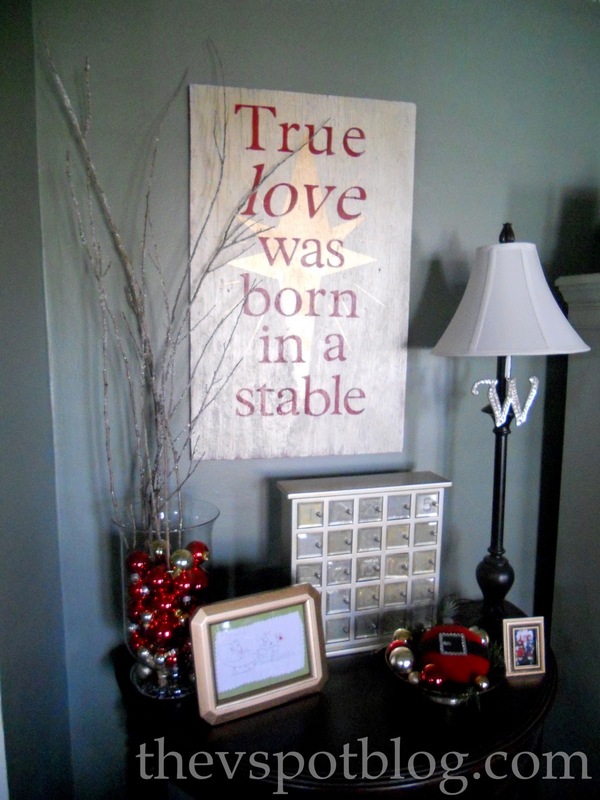 I saw a great piece of artwork from Red Letter Words that reads “true love was born in a stable.” I thought it was a beautiful phrase and totally reminded me of 1 John 4:19 which basically says that we are capable of love because God loved us first. I wanted to do a version of that phrase, but incorporate a Star of Bethlehem kind of design instead of the heart that the original version has. If you’ve been here before, you’re probably familiar with the technique I used to make it. I did it for my spring art work, last year’s Christmas art work, and most recently, my Edgar Allan Poe Raven art work. 1. I took an old piece of scrap wood that was hanging out near the woodpile. I spray painted it red, then cut out Contact Paper letters using my Cricut machine. I stuck them where I wanted them. 2. I took a metallic champagne colored spray paint and sprayed over the top of the whole thing. 3. When dry, I took Frog Tape (which has an uh-mazing crisp line when you remove it, by they way) and free-handed (free-taped?) a star design in the middle of the piece. I taped it over the Contact paper letters. 4. I taped newspaper over the rest of the piece to protect it from over-spray and sprayed the star area with Kryon’s Metallic Gold. When I peeled everything away, this is what I was left with. I’m happy with how it turned out. 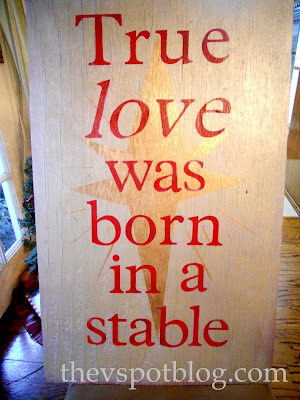 I love that the star is distinct and clear, but the metallic tones are subtle and don’t take the focus off of the words. 1. Gather needle nose pliers, wire cutters, a screwdriver and 2 little screws. 2. Sink the screws about halfway into the back of your piece of wood. make sure they are evenly spaced off of the center… they will hold the wire for hanging your art. Take a length of wire and wrap it around the screw. Twist with the pliers. 3. Hang on the wall. I love that this was free and basically took about an hour to make (not including drying time for the paint.) However, if you like it but don’t think you have the time or energy to do one yourself, I highly suggest you go over and buy one from Red Letter Words. Pick up one for yourself and maybe an extra for a gift… because we could all use a little more Christ in our Christmas these days. I am grateful for the reminder to focus on why we celebrate, and to do more than dream up ways to decorate for the celebration. Oh, gosh, Vivienne–this is wonderful! The artwork–especially the star–the reference to I John, your words, everything. God bless you for using your influence for such good. I am inspired by you on so many levels! That’s gorgeous! Way to go mama! 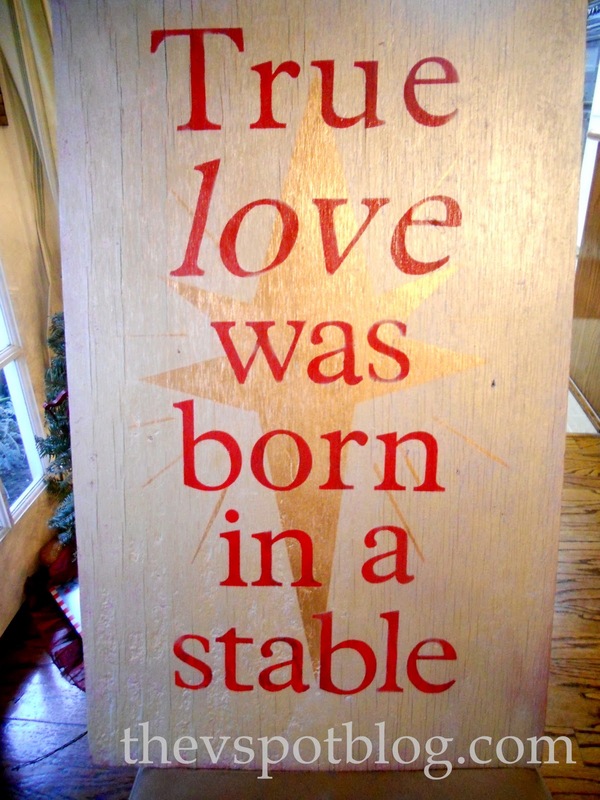 This is perfect…it’s beautiful AND shows the true meaning of Christmas. Vivienne! I love it! I will definitely be trying this! I LOVE this, Viv! Everything about it is just perfect! I love the technique you used. I may just have to make one for next year (since I still haven’t finished shopping or putting up the decor I already have this year:))! I’d be thrilled if you linked this up to my new party! Lovely and best of all QUICK!!! Beautiful job. Great tutorial. I have often wondered how people get the multi layers on their boards. Also, does contact paper really cut nicely on the Cricut? I have a silhouette and have often wondered if contact paper would work. Ok, I went to the site but I like yours WAAAY better. Can’t I just order from you? I’ll take 2. And no worries….it doesn’t need to be here by next weekend. I’ll use one as a gift for a certain MIL in January. WOW! What a statement! Love it! Wowzers! This sign is fabulous! I live it! So so beautiful!! Love it! And I think I could totally do that! Thank you so much for linking this to the party! It really is stunningly beautiful–and you make it sound so easy! This is going on my list to do before next Christmas! Amazing! I LOVE it. Absolutely love it. Thank you for the tutorial! I LOVE it!! I think you have made it look very easy…not sure I could pull it of as nicely as you have! Blessings to you this Christmas!